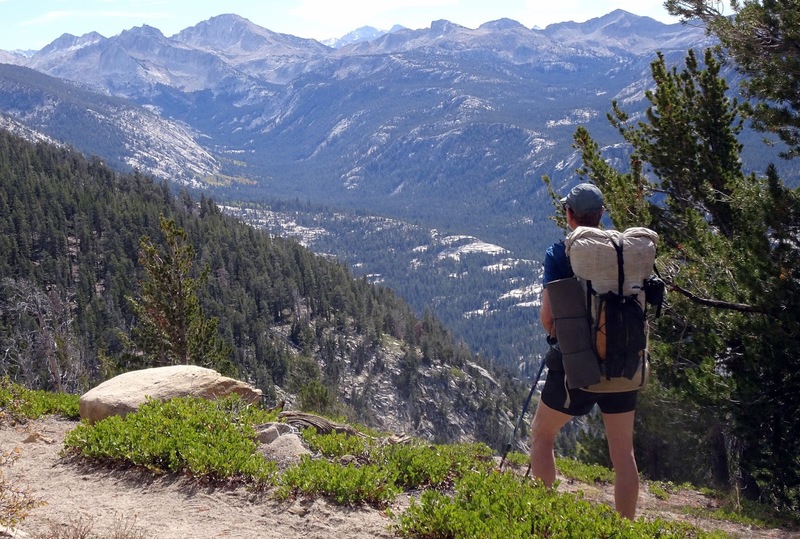 In 24 hours I fly to California in order to spend 2-3 weeks of hiking in the most spectacular surroundings imaginable, the High Sierra. I also plan to see some big Sequoia trees and camp under their arms. Something, perhaps, for every hikers bucket list? 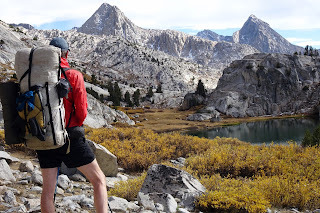 From my thru-hike of the John Muir Trail in October 2015. I plan to start my hike from Mammoth Lakes or more specifically Reds Meadow. My first and perhaps last resupply will be at Vermillion Valley Resort a k a VVR, like last year. I will follow the JMT/PCT for about a week, across the Muir Pass. After that I leave this trail and head southwest, into the Kings Canyon/Sequoia National Parks where plan to hike through some of the groves of big trees there. 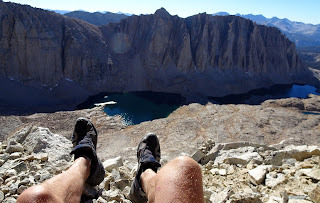 From Redwood Grove I will hike east and join the High Sierra Trail (HST) over towards Mt Whitney and down to Whitney Portal, ending in the nice little trailtown of Lone Pine. 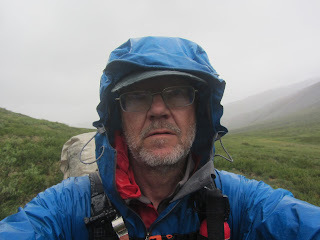 Interestingly enough, about a week ahead of me will be British hiking legend Chris Townsend, author of The Backpacker's Handbook and numerous other books on mountains and wild places. He will continue past Lone Pine into Death Valley and then on into the Panamints. We have compared schedules and unfortunately the chances for us to meet over a beer somewhere seem slim. You can read about his plans here. A resupply south of Vermillion would be nice or I will have to carry food for two weeks, which is a bit like going to the dentist. I can do it but I do not like it. I have some tentacles out. Somebody might be able to deliver a food package in person the the ranger station at Cedar Grove. Or the Cedar Grove Lodge will, or will not, accept a mailed resupply box. I will find out before I leave Mammoth Lakes. My white HMG Porter pack will accompany me this year as well. The gear I bring will be almost the same as last year. Starting with the pack, it will be my Hyperlite Mountain Gear Porter Pack 4400 simply because I need to bring a bear canister and might need to carry two weeks of food. Nothing else in my garage is big enough. The pack weighs 1060 grams including my homemade outside stuff pocket. Like last year, my sleeping bag will be my Western Mountaineering Super Ultralite. It weighs 890 grams and is nice when night frost creeps into the tent. I will bring two pads as usual. One full length closed cell foam, the Laufbursche UL Mat at 150 grams. The other is an Exped Synmat Hyperlite M (370 grams) and keeps my bones sofly cushioned against the hard Sierra rocks. Finally, my shelter. This is different from last year, when I used my old Gossamer Gear The One. Heavy condensation almost every night (temperatures were around freezing and wind was rare) made me long for another solution. I constructed such a solution and tested it during Coast2Coast Sweden this year. I was very pleased. It is a very spacious and condensation proof/protected shelter, ideal for forest use. It is likely not stormworthy above timberline, even if I can pitch it in a much lower profile than shown in the photo below. It weighs 520 grams plus pegs (100 grams). For more on the construction read here. 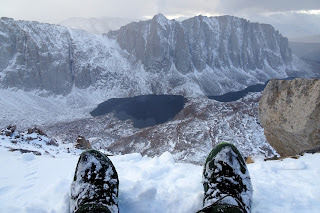 Haglofs shoes and Goretex shoes worked very well in the snow on the JMT last year. On my feet I will wear my Haglofs Hybrid II with a double layer of thin merino socks. As a backup for rain and snow I will bring a pair of Rocky Goretex socks and my old Helly-Hansen pile socks for insulation. Cooking will be done on my Primus ETA Lite canister stove. That is about it, I guess. The High Sierra in autumn is a wonderful place. The crisp air makes it possible to see forever. The low incidence of hikers reminds you of when the world was young. The sun shines most of the time and temperatures in the daytime are like a warm Swedish summer. The nights however clasp a frosty hand around you, telling you that winter is near. Hiking the Sierras in October is flirting with winter. But it is worth it.